You can use 1CLICK DVD MOVIE to convert movie files (ex: Xvid, DivX®, AVI, MPEG and QuickTime®) to DVD movies. Ensure codecs are installed. Movie files (ex. Xvid, DivX®, AVI and QuickTime®) contain compressed audio and video which are encoded using an audio and video "codec". 1CLICK DVD MOVIE installs the open source "ffdshow" codec to read movie files. ffdshow is compatible with most movie file formats. If the file you are attempting to convert is not compatible with ffdshow, you will need to install an appropriate codec. Choose high quality movie files. Movie files from "unknown" sources may play correctly using your media player software, but may in fact be poorly constructed. This can lead to errors during the encoding phase and can cause audio and video synchronization problems when converted to a DVD. 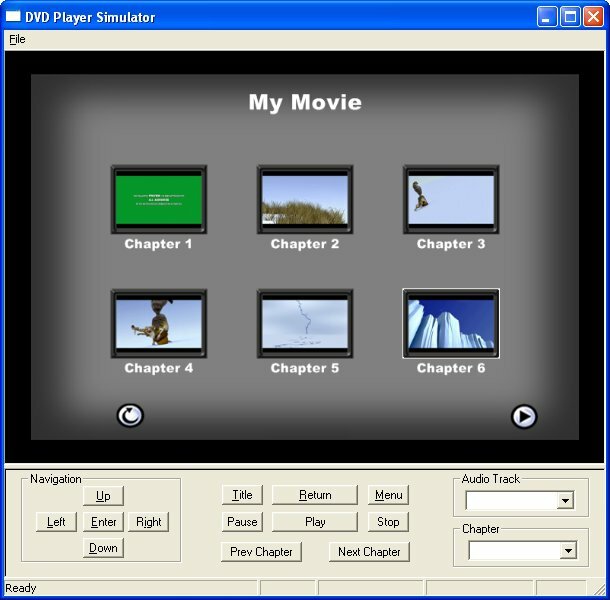 Commercial programs usually produce better quality movie files than freeware tools and movie capture cards often produce poor quality movie files because of repeated frame drops. 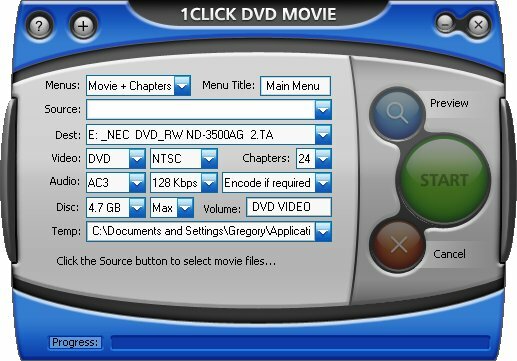 Update your DVD/CD writer firmware. Many DVD/CD writers are not compatible with newer DVD/CD media/formats until the firmware has been updated. You can get firmware updates here: Firmware updates. Use good quality DVD media. Premium media from companies like Verbatim, Taiyo Yuden, Sony and Ricoh and Panasonic usually outperform budget media like Memorex, Princo and others. Avoid inexpensive media which costs half the price of good media. Refer to the manufacture for a list of recommended media for your DVD/CD writer. You can read more about media here: DVD Media reviews. Click on the Options button to view the Options Window - click again to return to the Main Window (default). 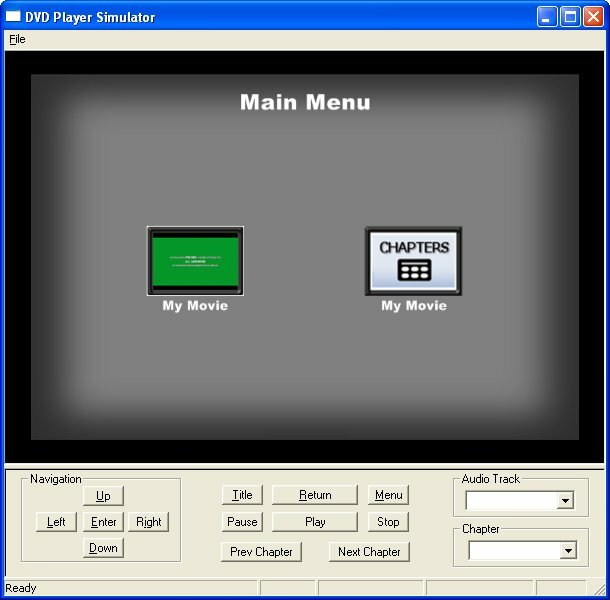 Menus: There are four different menu options available: "None", "Movie", "Chapters", "Movie + Chapters". The default value is "Movie + Chapters"
Choosing "None" will ensure that no menus are added to your movie - this setting is ideal if you have only one movie file. The "Movie" option will create a menu containing a single button for each movie file. 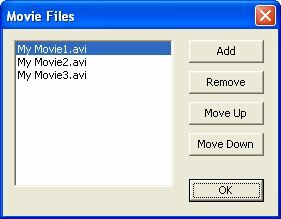 The movie file name (less the file extension) will be used for the name of the menu button, so you may want to rename your movie files before you add them. 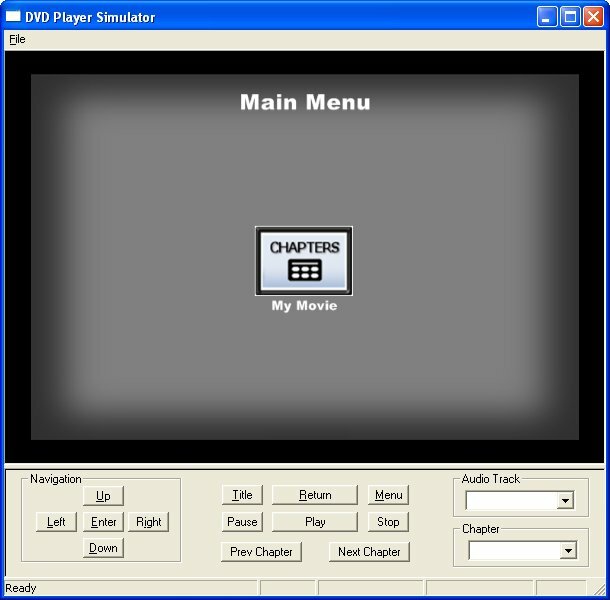 The "Chapters" option will create a menu containing a single "Chapter" button for each movie file, and a sub menu containing a thumbnail picture button for each chapter of the movie. The "Movie + Chapters" option will create a menu with both a movie and chapter button, with the corresponding submenu for chapters. Menu Title: You can choose a title for the main menu. By default, the title is "Main Menu". If you want to burn a DVD from a 1CLICK DVD MOVIE project that you created, simply select the "1Click.dvd" project file located in the project's "OpenDVD" folder. For example, if your Destination path is "C:\Movies" and the Volume name is "DVD VIDEO", you'll find the "1Click.dvd" project file in the "C:\Movies\DVD VIDEO\OpenDVD" folder. To view the "1Click.dvd" file, select the "OpenDVD Project files" item from the "Files of type:" drop down box as shown below: Once the project has been loaded, simply click the Start button to burn the DVD. Destination: Use this option to select a drive letter corresponding to the device you wish to save the DVD onto. If the drive letter you select is a DVD/CD writer, you will be asked to select your writer from a list of devices installed on your computer (you may have multiple writers). You can also save a project to a hard drive folder if you don't want to burn it right away. 1CLICK will attempt to select a DVD writer by default. If you have more than one DVD writer, you may wish to select a different device. Video: Use this option to select the type of video disc you want to create. The default is 'DVD', however you can also make a VCD or SVCD. Each movie type uses a different compression scheme. Choosing 'DVD' will result in the best quality. The other two types are lower quality and in many cases unless the original move file is of short duration, the disc type may not be large enough to hold the entire movie. The default value is DVD. Format: Use this option to select the broadcast standard (format) of the DVD. If you live in the United States, the format to select is "NTSC". Other countries like those in the European Union may use "PAL" as the broadcast standard. The default value is NTSC. Chapters: You can select the number of chapters you wish to have in your movie. The number of chapters you select is applied to each movie you select in the Source. The default value is 12 chapters. Audio: There are three types of audio available: PCM, AC3 and MPEG. Depending on the type of Video and Format you have selected, they may not all be available. By default, for DVD movies the audio type is AC3 because of it's superior compression and sound quality. PCM audio uses much more space on a DVD and will leave less room for the video information, so it's not recommended. The default value is AC3. Bit-rate: You can choose a bit-rate for the audio. The bit-rate determines how much compression is used to store the audio information. The default setting of 128 Kbps for AC3 is the recommended setting and will preserve as much space as possible for the video information. Encoding: You can choose to re-encode the audio for all files, or to only encode all when it's not in the correct format for the selected Video disc type. The default value is "Encode if required". Disc: Use this option to modify the disc (target) size of the movie. Depending on the disc capacity of the media (DVD/CD) you are writing to, you may wish to modify the default value provided. You can also use the "Disc" size option to set the target size for movies saved to your hard drive. The default value is 4.7 GB (for a DVD). Burn Speed: Use this option to select your preferred DVD/CD write speed. If the chosen speed is higher than the maximum speed of the DVD media, the software will choose the maximum speed allowed by the media. The default setting is "Max" which works well in most cases, however if you encounter burning errors we recommend you choose a lower writing speed (4x has shown the most success) because some brands of DVD media will not burn well at their maximum rated speed. Volume: The "Volume" is the name which will be written on the DVD disc. The default value is "DVD VIDEO". Temporary: You can change the folder that the software uses to write temporary files while encoding. This folder may need to be as large as 12 GB in some cases (depending on the Disc size). By default the software will use a folder in the Windows Application Data folder. (ie. "...<Username>\<Application Data>\1clickdvdmovie\Temp"). Preview: Use this option to preview the project prior to converting the movie files. If you have enabled one of the Menu options, you will have the opportunity to view and try the menus which will be created on the final disc. You can click on the on screen menu buttons using your mouse or simulate using your remote control by clicking on the remote control buttons. 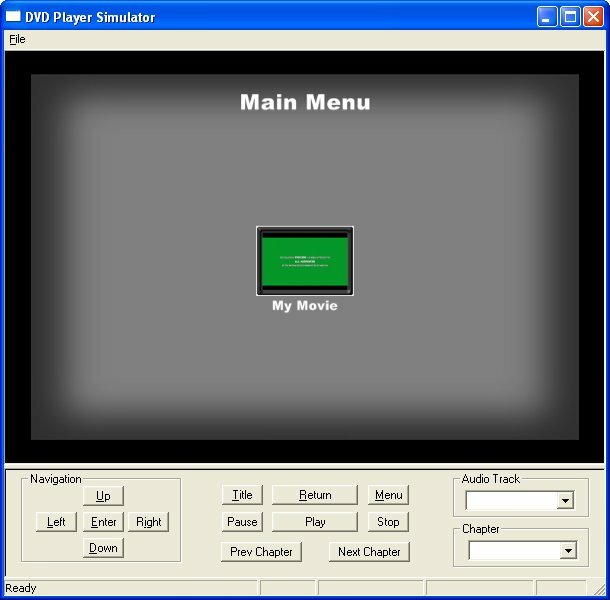 Note that there is a short delay each time you change menus while the simulation engine computes the next menu. F1: Opens this User Guide in your internet browser. F2: Open the Registration (activation) window. F3: Enable or disable notification of new updates to the software (you need an internet connection to receive update notification). F8: Opens the 1CLICK DVD MOVIE log file. You can save this file to your desktop and attach it to an email when contacting customer support. DivX® is a registered trademark of DivXNetworks, Inc. QuickTime® is a registered trademark of Apple Computer, Inc.